My best Asian broth yet! The addition of kaffir lime leaves and galangal really take it to another level. Also using real enoki and fresh baby corn wasn’t too shabby either. Now I just need to go find this special ingredient for the next time I want to make this heartwarming soup. This soup is also so customizable! 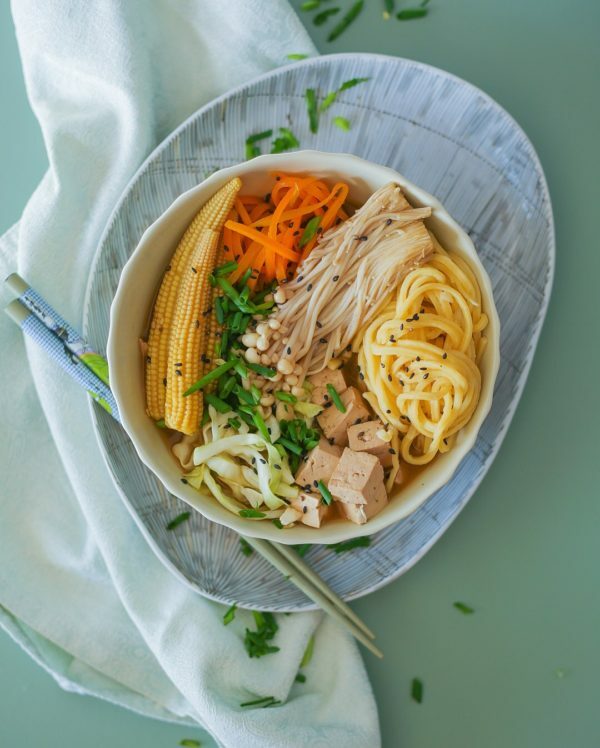 You can choose any noodle that you want or even forgo noodles altogether and you can play with which protein you want, definitely doesn’t need to be tofu if you are not into it. You can use chicken, meat or go for 6-minute egg, yum! And best of all, you can choose with veggies you want. Some other veggies not featured here that work well: all mushrooms, peppers, radishes, zoodles, onions, purple cabbage, bok choy, sugar snap peas, and chilis! Place the broth and water into a large stock pot and add in the onions through the kaffir limes. Bring the soup to a boil and lower the flame to a simmer. Add in the soy sauce, mirin, rice vinegar and salt, starting with less and add according to taste. Simmer for 30-40 minutes, to really let the flavors develop. Once you are happy with the taste of the broth (you can adjust the salt and other seasonings), using a slotted spoon remove all the aromatics from the soup, only reserving the onion if you wish to incorporate it into your soup bowl. Place the tofu in a bowl and drizzle with soy sauce and mirin, just enough to coat. Mix around until all the tofu is coated and let marinate. Using an Asian dumpling/noodle strainer (what I used in my Insta Stories), spider strainer or fine mesh sieve, we are going to cook each vegetable to your preferred tenderness. Place each vegetable separately into the basket or sieve and lower into the soup—you want something that can get down all the way into the broth. Place the vegetables in the broth and cook for however long you like. I like my carrots tender and not crisp so it was around 5-7 minutes. Cabbage I like crunchy and it cooks quickly so around 1-2 minutes before it starts to wilt too much. Baby corn you want to cook through so around 5 minutes until it turns a nice yellow. If your edamame is frozen you want to warm them so around 4-5 minutes, just until they are cooked. Enoki mushrooms cook very quickly so 1 minute is usually enough. You can even just steam these by not lowering the sieve all the way to the broth if you really want them to maintain their shape. They might shrink and get clumped together within the broth. You can cook your scallions or save them to use raw over the whole soup bowl. you cna also do half and half. After each vegetable is cooked to your desired doneness, remove to a plate for serving. For the tofu, remove from the marinade and discard the marinade. Place the tofu into the sieve and lower into the broth. Let it cook for around 10 minutes. 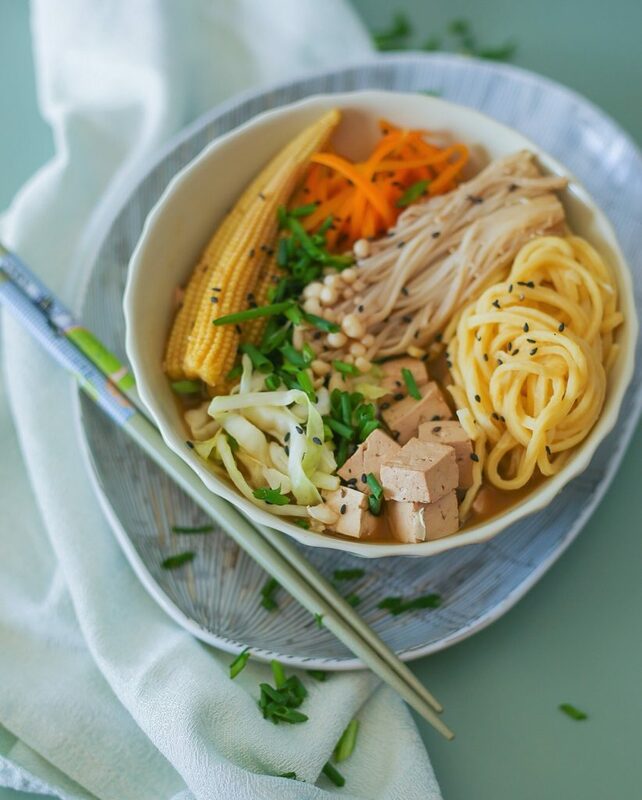 You can also replace tofu with other proteins like chicken or meat, just place them into the broth directly and let them cook until cooked through and remove with a slotted spoon. Set up your soup bar with all the different vegetables, tofu, noodle of choice and broth and let everyone build their own bowl! *To bruise the lemongrass, cut off the tough part from the bottom, around 1/4-1/2 inch, You'll feel where your knife stops meeting a lot of resistance. Take off 1-2 of the dry outer layers. Using the side of your knife, smack the lemongrass until it starts to smash, just like when you press down on a garlic with the side of a knife. **For the jalapeño add in as little or as much as you think you'll like. I added around 1 inch of jalapeño and it gave a slight hint of heat to the soup which is what I like. If you like really spicy add the seeds in to. If you don't like any heat, don't add any jalapeño at all!